Comment: In The Gift of the Tree, we see how the tree meets the forest animals where they are. 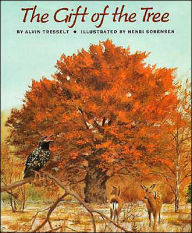 The tree provides for different needs of all the animals and the forest over it’s life and even death. As the tree ages, it changes and thus is able to provide for the world around it in a new way. Even as it dies and becomes a part of the land again, it provides gifts to all those who encounter it. These words from Isaiah point to a gift to us. A child who is to be called, “Wonderful Counselor, Mighty God, Everlasting Father, Prince of Peace” (9:6). This child will be all things to all people. He will lead and have compassion. He will be just and righteous. He will show the world a new way to live. This child will give us hope forevermore. Like the tree that continues to provide for the forest, this child will be hope for generations to come. We have been given a great gift in the form of child. His many names show how he is able to fulfill many roles and meet many people’s needs. We celebrate the gift of Jesus in the form of a baby breaking into the world. The birth of a baby suggests joy, hope, and celebration. Comment: As Christians we are supposed to live lives marked by self-control and godliness. Our lives are to mirror Christ. The reading from Titus reminds us of this expectation. 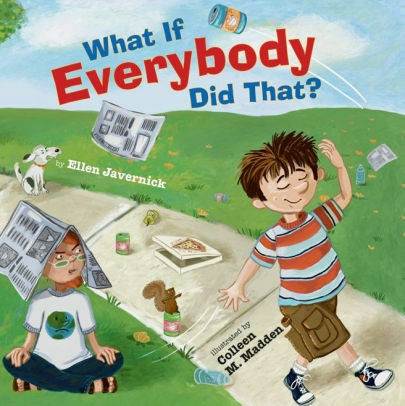 Javernick explores what right living look likes in the life of a young boy in What If Everybody Did That?. He chooses to share his popcorn with the bears, talk during story time, litter, among many other things. Each time, an adult stops him and ask, ‘What if everybody did that?’. Children will see how the small things we do each day affect the world around us and will learn a way to check their behavior. Children can be encouraged to think about the way their actions will affect others. Javernick ends his story with the young boy going home and giving his mom a hug. We all, even young children, can live lives that reflects Christ. Comment: The Gospel reading this evening is the familiar story of Jesus’ birth. It is a story that many in the congregation have phrases memorized. Yet, for some this is the first or second time they are hearing the story, so it is very unfamiliar. This is a story that I hope all children hear often enough, that they can tell the story to someone else as it is a central story to our faith. In The Birds of Bethlehem, we find birds from all over Bethlehem that have come together for breakfast and gossip. Each pair of birds tries to one up the other as they tell the story of seeing and hearing the events leading up to Jesus’ birth. Reading the birds’ excitement as they tell what they have seen keeps the excitement building. It was easy to get swept up in the joy and excitement as I was reading this book. Thanks to Elizabeth Boulware Landes, associate pastor at Faith Presbyterian Church in Aled0, TX, for writing an extra set of Revised Common Lectionary Links to go with Proper 1 for a Christmas Eve service. Lectionary Links (RCL): Christmas Eve, 2017 by Storypath is licensed under a Creative Commons Attribution-NonCommercial 4.0 International License.